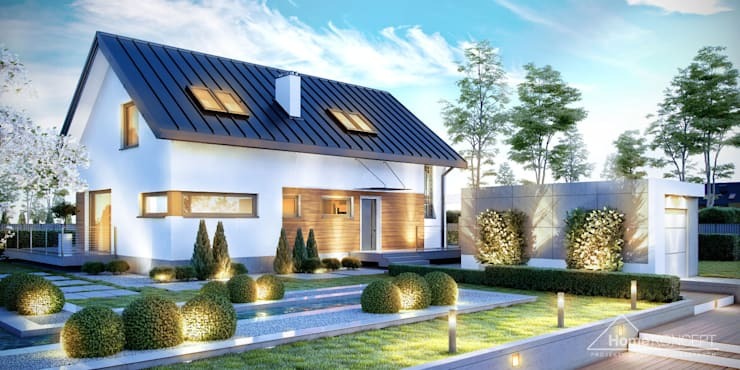 The architects at Homekoncept in Poland designed this energy-efficient home that’s well-proportioned and suited to modern life. Simplicity, minimalism and energy efficiency are at the heart of this home. With an exposed vertical chimney and a classic gable roof, this home would be a darling addition to any neighbourhood. Energy efficiency was taken seriously when they designed this home. Specialised ventilation with a heat recovery system helps lower energy use. Effectively sealed doors and windows help to maintain the temperature inside and prevent heat loss in the winter. New insulation in the walls is also energy efficient. Even the separate building for a garage was chosen to cut down on heating costs. 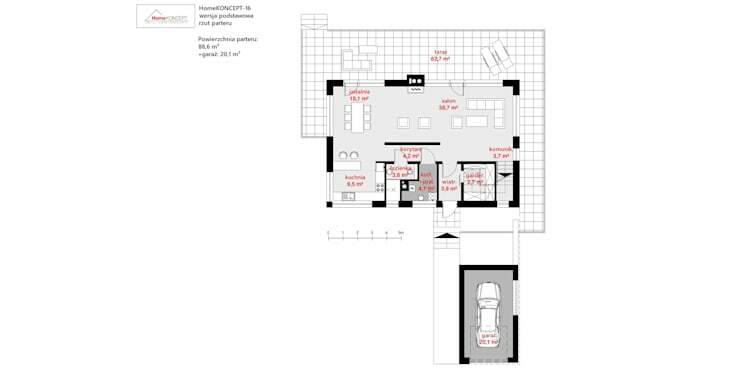 Elegantly finished interiors have optimised floor plans to make the most of the compact space. The main floor is an open plan design. A fireplace separates the dining area from the living room. Impressive glazing helps bring natural light into the living room. On the second level, there are three comfortable bedrooms. Surrounding the home is an exciting outdoor terrace. You can relax in the fresh air from the comfort of your own home and take in a little sun while you’re at it. Let’s take a look now at the home’s exterior and then take a closer look at the detailed floor plans. We love the classic gable shape of the home. A cheerful white facade is accented with wood and topped with a heavy black steel roof. Look closely and you can see the terrace wrap around the home, creating outdoor spaces. From this angle, we can see more of the intriguing glazing and skylights that help bring light into the home. More wood accents warm up the entrance to the home and break up the cool modern look. 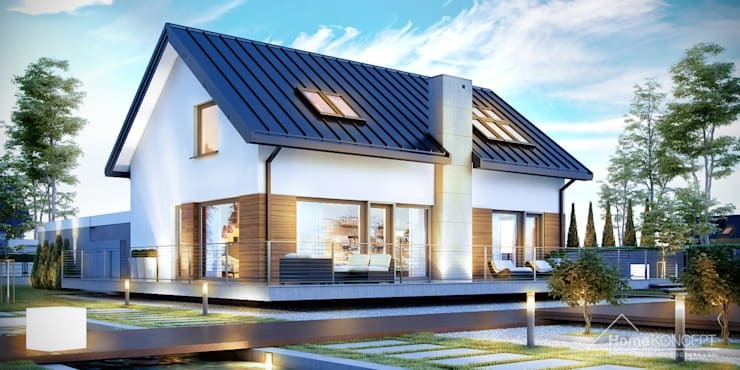 Simple and charming, this energy efficient home concept is perfect. The main floor has an open plan arranged in an L-shape that connects the kitchen, dining, and living room. This natural flow is absolutely necessary for a comfortable and livable home. The spacious terrace almost doubles the available floor space! Upstairs, three bedrooms share a bathroom. Each bedroom fits more than just a bed. These multifunctional spaces could be used as offices, too. 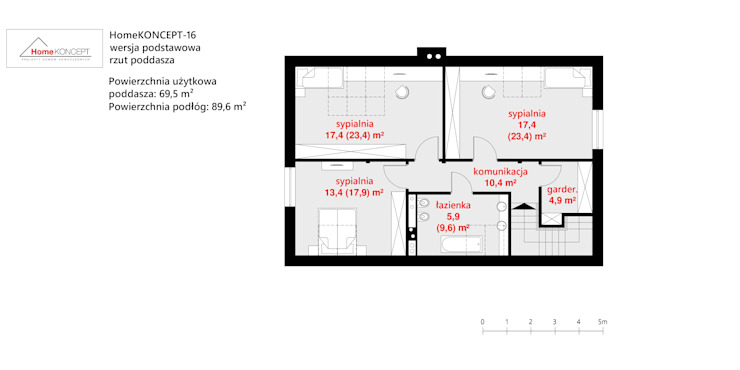 This kind of layout is perfect for a growing family or a group of students sharing a home. 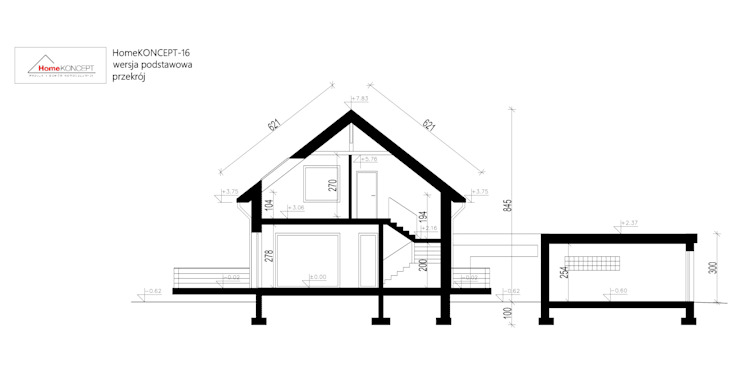 These plans show off the simplicity of the design and how efficient the architects were with their available space. Next, check out our feature on 5 modern homes with floor plans to copy! What are your thoughts on this Polish project?